Believers of the QAnon conspiracy theory were overwhelmingly excited by President Donald Trump’s State of the Union address before Congress last night, interpreting various details of the speech as proof that their wild beliefs are, in fact, grounded in reality. For the uninitiated, the QAnon conspiracy theory goes like this: President Trump and Special Counsel Robert Mueller are secretly working in concert to upend a global network of satanic pedophiles that includes many prominent political, entertainment, and business leaders. To get information to the public about this secret plan, followers believe that Trump ordered someone with top-access to classified government secrets to call themselves “Q” and post cryptic riddles on an anonymous image board in order to reveal details about the progress of the secret plan by dropping cryptic hints that need to be properly decoded. QAnon followers are currently waiting for mass arrests to take place and for the people that they believe to be pedophiles to be rounded up and tried by military tribunals. Before the event began, QAnon supporters were bubbling with anxious anticipation, wondering how Trump would use his speech to drop subtle hints that the conspiracy theory is true—something that conspiracy theory debunker Mike Rothschild refers to as “hopium.” Rothschild also pointed out how the pre-hype resembled the QAnon community’s anticipation of last year’s State of the Union event. 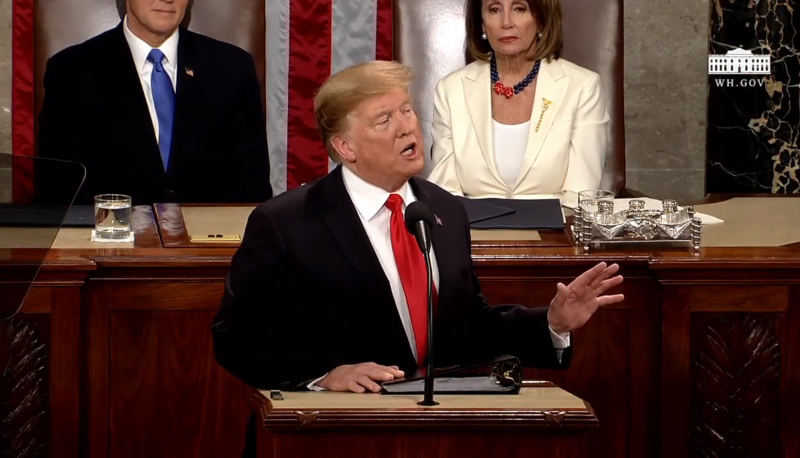 But events like the State of the Union tend to have a temporary unifying impact on QAnon followers, and last night’s speech proved to be no exception as activists raced to find creative ways to interpret Trump’s speech so that it somehow validated QAnon. One of the first attempts at claiming a “proof” was inspired by the necktie Trump wore, which hung off-center during his speech. “17 sailors. Tie tilted 17 degrees. Stopping human trafficking to cut off demoRATS supply of adrenachrome,” a Twitter user wrote. Trump mentioned “17 Sailors” who died in the 2000 U.S.S. Cole bombing when calling attention to the father of a slain sailor he invited to the speech. “The POTUS tie Curves down and to the right like the tail of a Q you say… There are NO coincidences,” another posted. One QAnon follower mistook the antique inkstand resting on House Speaker Nancy Pelosi’s desk to be glasses containing alcohol and speculated whether it was “possible symbolism.” Another simply covered their television with a blanket so they didn’t have to see Pelosi. A believer calling himself “Santa Claus Of The United States”—really—posted photos that seemed to be meant to convey that he had ridden in President Trump’s motorcade on the way to the Capitol Building to deliver his speech. Others used the State of the Union address to continue peddling their theories that Supreme Court Justice Ruth Bader Ginsberg is dead. Others thought that Barack Obama’s silence on the speech was proof that he was already detained in Gitmo. When someone gifted Trump a watch after his speech, it caused one user to believe that the master “plan” prophesied in QAnon circles had finally been activated. One supporter speculated that Trump’s mention of the D-Day invasion in his speech was a coded reference to a Q post. But perhaps the most impressive stretch we witnessed was a follower attempting to crunch numbers and prove that the president tweeting a link to his State of the Union address was a signal to the QAnon community. At one point in Trump’s speech, he praised his administration’s support for Israel, which some interpreted as a safeguard designed to prevent him from being assassinated. “I’m gonna say that bit was just to prevent getting JFK’d,” one QAnon follower wrote on Voat, a social media platform that QAnon believers flocked to after their community was shuttered by Reddit. A QAnon YouTube channel posted a video celebrating the State of the Union with a slideshow of Trump photos and edited images featuring QAnon insignia. “This was literally one of the most epic moments in the history of our country,” the narrator of the video said.